The net effect of any series of rigid transformations can be duplicated using at most three reflections. The window below shows preimage, poly1. It also shows two other figures, poly2 and poly4, which are congruent to each other. Points F and R are TRANSLATION points. If you drag them, they will translate their respective figures. Points S and G are ROTATION points. If you drag them, they will rotate their respective figures. (Try it for yourself.) 1. By only dragging poly4, determine whether poly4 is congruent to poly1 based on the transformations definition of congruence. Then put poly4 back in its original location. 2. 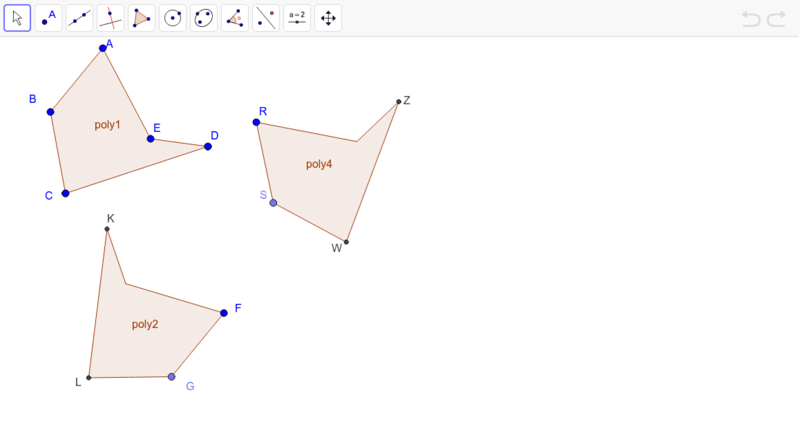 By dragging only, take poly4 through a series of translations and rotations that would make it appear most difficult to map poly1 onto it using only reflection. In other words, use a zany, random series of translations and rotations. 3. Using only the tools in the toolbar (check them all out), show that poly1 can be mapped onto poly4 (in its new location) using only reflection, and at most three reflections. 4. Restart the applet and repeat steps 2 and 3 substituting poly2 in place of poly4. Precisely describe the general technique you used to map the figures onto each other using only reflection. Discuss how your results support or refute the Three Reflections Conjecture. Explain how you were able to establish that poly1 was congruent to poly4 according to the transformation definition of congruence. Explain why you were able to accomplish this using only translations and rotations (i.e., without using reflections). Write a short paragraph proof to explain how establishing poly1 congruent to poly4 allows you to conclude that poly1 is congruent to poly2.